This was an absolutely amazing movie! I feel like those people that didn’t like it could be coerced out of their opinion easily. The acting is great, the script is great, the characters are extremely unique and complex. It’s sad but not depressing–more uplifting. It doesn’t make you cry for crying’s sake. The tears you shed will feel earned and your emotions won’t feel used. And you can’t sleep on the humor in this movie. It’s actually really funny, but the jokes never kill or ruin the emotion and sadness, but instead comfort it. 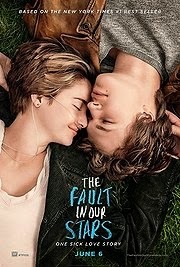 Some may say that Gus and Hazel’s relationship is unrealistic and overly perfect, but just remember that these are people who are facing death in a very real way, so the little things that you and I worry and argue about become unimportant to them. To me this was a great film. It just might be the most entertaining love story I think I’ve ever watched.